← Richard Lloyd Presents New Album ‘The Countdown’ with a Live, In-Store Acoustic Set at Amoeba Music in Hollywood! Now playing at the Marilyn Monroe Theatre in West Hollywood, Sixty-six Theatre Company’s “Blue Surge,” by Pulitzer Prize-nominated playwright Rebecca Gilman. This review features the “Blue Cast” with Eddie Alfano as Curt, Hope Quattrocki as Sandy, Steve Mize as Doug, Whitney Anderson as Beth, and Rosie Koocher as Heather. 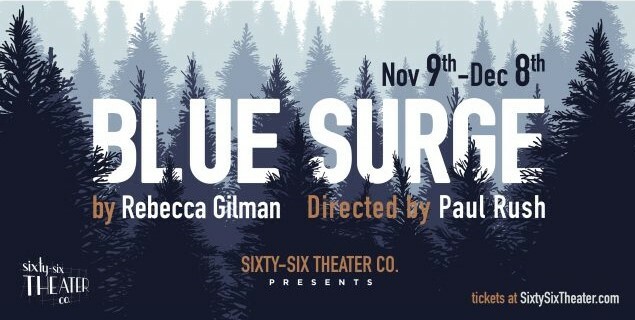 Now playing, Sixty-six Theatre Company’s “Blue Surge” is written by Pulitzer Prize-nominated playwright Rebecca Gilman. The theater company is headed by the show’s Director, Artistic Director and Actor, Paul Rush, along with partners Maggie Cleary and Coleman Kelly, where they are currently in residence at The Marilyn Monroe Theatre at the Lee Strasburg Theatre & Film Institute in West Hollywood. During an attempted entrapment in a Midwest massage parlor during the autumn months, cop and aspiring park ranger Curt (Eddie Alfano), meets Sandy, a young masseuse and his mark in a sting operation. In that fairly brief encounter, the two form an unlikely connection, despite that fact that Curt is already connected with Beth (Whitney Anderson.) Doug (Steve Mize)—Curt’s friend, fellow police officer, and seemingly (on the surface) a little on the dim side—returns to the same massage parlor for the same reason, encountering Heather (Rosie Koocher), Sandy’s roommate, which produces very different results than Curt’s. A cultivated woman of privilege, Beth urges Curt to climb the proverbial ladder if only so she can see him at her social level. Curt, having a radically different upbringing than Beth, wants to grow and change, but not in a way that Beth thinks. After meeting Sandy, his desire to see her is matched only by his desire to “help” her. What follows is a dance within the forming, evolving, and even parting of respective relationships. Unsurprisingly, the strongest couple to survive is the one where each accepts the other for exactly who they are. What is surprising is the couple. All others suffer from the mistake that most of us make: desiring to change or mold another person in order to best suit our ideal. Alfano’s Curt is played with sensitivity and insight, makes the character’s deeper pain tangible. Quattrocki’s Sandy manages to convey both a strong and sensitive woman without pandering to the prostitute-with-a-heart-of-gold stereotype. Mize’s Doug, while providing some brief moments of comic relief in some of the character’s absurdities, successfully brings about a surprising transformation within his character. Koocher’s Heather gets just all the best lines and uses them to her advantage, playing that roommate that everyone has had…or dreads having. And Anderson brings about a sympathy to Beth that, in the wrong hands, could get lost when playing the spoiled-rich-girl stereotype. A little Duke Ellington fits in here as well, which was thought to be an obscure connection at first until a little history is revealed involving the fabric of a man’s suit and whether what he chooses to wear defines—whether a person is seen as worthy, regardless of whether they be of the leisure or working class. Although the first half moves a smidge slower than the second (and there is no intermission), Rush provides each of the actors room to grow within their characters during that time, especially where some individual transformations are that extreme. In a somewhat surprising observation near the end, Doug says to Curt, ”Man, you know, you should pay attention to your life!” The line—in context with the body of the play that proceeds it—is actually a little funny. In truth, this is the most poignant of observations, applicable in any context. The “Blue Cast” alternates performances with the “Surge Cast” stars Rush, Eliza Padden, Matthew Callari, Mia Macron, and Helen Menafee. The latter cast care scheduled to perform November 29, 2018, and December 6, 2018. “Blue Surge” is now playing through December 6, 2018, at Marilyn Monroe Theatre, 7936 Santa Monica Blvd, West Hollywood, CA 90046. Showtime tonight, Saturday, November 17, 2018, is at 8:00 p.m., and continues through to Saturday, December 8, 2018. Tickets are $20 General Admission, $25 at the door. See website for specific dates and showtimes. UPDATES: 11/17/18 1:45 p.m. Whitney Anderson plays Beth, and Rosie Koocher plays Heather. This entry was posted in Theater and tagged Blue Surge, Coleman Kelly, Eddie Alfano, Eliza Padden, Helen Menafee, Hope Quattrocki, Lee Strasburg Theatre & Film Institute, Maggie Cleary, Marilyn Monroe Theatre, Matthew Callari, Mia Macron, Paul Rush, Rebecca Gilman, Rosie Koocher, Sixty-Six Theatre Company, Steve Mize, Whitney Anderson. Bookmark the permalink.